Q: Where can I see the science topics on the ACT? We have a blog post that lists all of the science topics you can expect to see on the ACT. Click here to see that list. 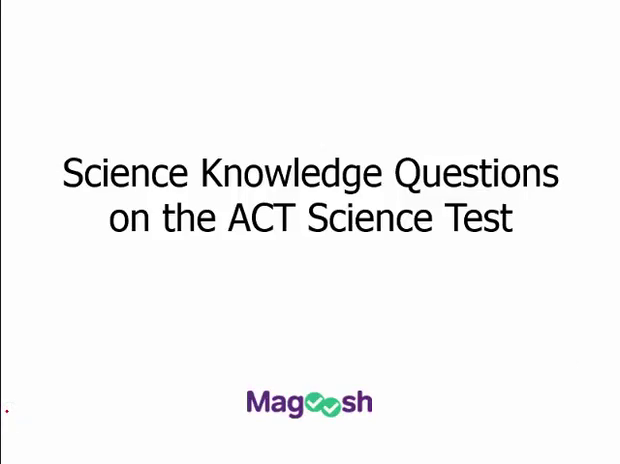 Welcome to this Magoosh ACT lesson on the science content you need to know for the ACT Science test. The short answer to the question of how much science you need to know for this exam is not much which sounds strange for a test called a Science test, but. Unlike the English and math sections of the ACT, it would be a lot more difficult for the ACT. To create a section testing what knowledge students are supposed to have learned in science in school because that can vary widely. So instead, the Science Section focuses primarily on the skills that you need to analyze scientific situations and results. Such as how to read charts and graphs, and how to draw inferences from data but, this doesn't mean that having a strong grasp on science won't help you. And in fact, you'll find that there will be several questions on the ACT science test that do ask you to bring in some information from your science studies, albeit on a very basic level. So how much science do you need to know for the ACT Science Test? Currently, you can expect an average of two to four questions per test that rely on bringing in some basic outside science knowledge. Now, there's no hard and fast rule but it is true that there seems to generally be more questions pertaining to biology and chemistry than physics that require outside science knowledge. And this may be because most students take biology and chemistry in their freshman and sophomore year. But can not necessarily be expected to have taken physics before they take the ACT. But this doesn't necessarily mean that physics is off the table. Some questions may reach back to middle school physics knowledge. And that is certainly fair game for those tests. I should reiterate once again that the vast majority of questions do not require outside knowledge. This means that a lot of students studying for the test prefer to ignore this aspect entirely in their preps. So if they see one of these questions on the test and they know the answer, they answer it. If they don't, they take their best guess and they move on and this is definitely a fine strategy for a lot of students. There are so many more things you can be focusing your energy on that you know will appear on the test. But for students aiming for a top, top score, that doesn't quite cut it. You do want to make sure you are on top of your basic science knowledge game so you can answer these questions. So that brings me to the question, how can I prepare? I wish that I could give you a comprehensive list of all the science knowledge the ACT might test. But I just can't.There is no definitive list out there and ACT wont tell you. However, that doesnt mean that you cant refresh your knowledge of the basics that have been tested in the past or could be realistically tested on the ACT test. First of all, all students should review the basics of the scientific method. We have a separate video of the scientific method for your review. At Magoosh, we have also compiled a list of basic science topics that you can check out. And the link is below this video and doing this should put you in good shape for whatever the ACT might throw at you. And remember, that you just need the basics. The overview of each topic that you find in your science textbook or on Wikipedia should be enough to help prep you for these types of questions. And it should hopefully go without saying that you should really be paying attention in your current science classes. Take good notes, make outlines and flashcards of the basics. This will help you on the ACT. You can also read science articles in science magazines or in academic science journals if you're feeling really motivated. and that will help you get more comfortable with the material. And finally, if it seems to you to be a little futile to try and study a wide range of science topics in hopes that some of them might be directly tested on the ACTs. Remember that refreshing yourself on basic science topics will not only help you on the science knowledge questions, it will help you feel more comfortable with the passages on the test in general. There may not be a question on the process of DNA replication. But reviewing it will help you instantly get more out of a passage that deals with this topic. So let's take a brief look at a couple example science problems, so you know what they might look like on the test. Sometimes they might be really obvious. The question might specifically ask you to identify some scientific process that appears in the passage or in the figures, like this one. Figure 1 shows the studied cell undergoing a process of mitosis, mutation, osmosis, or absorption? And nowhere in the passage will it provide the definition or term that you need to answer this question. The only way to answer it is to be able to recognize that this is a process of cell division known as? I will give you a moment to shout your answer at the screen and congratulations if you said A mitosis you're correct. But most of the time, it's not going to be quite that blatant, that the ACT is giving you science knowledge question. So, check out this example. Based on the data given in Table 1, at 37 degrees celsius, the Group 7 elements, chlorine, bromine, and iodine shown in the figure exists in what state or states? A, two are solids and one is a gas. B, two are liquids and one is a gas. C, one is a solid, one is a liquid, and one is a gas. Or D, all three are solids. Okay, so, assuming that none of this information on where, whether solids and liquids and gases appear anywhere in the passage. You have to rely on your own knowledge. So here, we have to know the basics of solids, liquids, and gases and how they relate to what we do have. And that is melting point and boiling points. So the melting point of a solid is when it turns into its liquid form. And the boiling point is when the liquid form turns into its gas form. So you can think about water as a simple example. So at 0 degrees celsius the solid, which is ice, melts into liquid water. And at 100 degrees celsius, the boiling point of water, liquid water turns into water vapor. So let's take a look at chlorine, bromine, and iodine right here in this row. So, 37 degrees celsius, the temperature we're looking at, is above the melting point and the boiling point of chlorine therefore chlorine is a gas at this temperature. It is above the melting point but below the boiling point of bromine and it is below both the melting point and the boiling point of iodine. So therefore, iodine would be a solid at this temperature. So iodine's is a solid, bromine's a liquid, chlorine's a gas, and so our answer is C.